After finally finding their identity halfway through the year in 2014-2015, the Celtics managed to make the playoffs as a seven seed. Although they were swept in the first round by the Cavaliers, they showed us that the rebuilding process wasn’t going to take as long as we initially thought. Heading into 2015-2016, there were a lot of predictions that had the Celtics around 50 wins, but there were questions as to whether or not they had the star power to make that happen. The C’s opened the season with a win over the Sixers, but quickly fell to 1-3 after suffering three straight losses to Toronto, San Antonio, and Indiana. They were able to get their record up to .500 by winning the next two against Washington and Milwaukee before losing to the Pacers again. With a win in Oklahoma City on November 15th in a game that saw Marcus Smart outplay Russell Westbrook, the C’s had a winning record for the first time in the Brad Stevens era as they improved to 5-4. They jumped to 6-4 the next night with a win in Houston before dropping three out of four to fall back to .500, a skid that was capitalized by a 121-97 blowout loss in Atlanta on November 24th. As we know, this was the first of many times in which the Hawks would give the Celtics problems all year. The player who gave them the hardest time during the regular season and the playoffs was Paul Millsap. In this particular game he finished with 25 points and nine rebounds. Boston’s best big man was David Lee (remember him?) with 10 and six. After that loss, winning started to become more of a habit for the C’s. They took six of their next eight to improve to 13-9. They were led by Isaiah Thomas, who averaged 21.6 points per game over that span, as well as Jared Sullinger. In those eight games, Sully had four in which he grabbed 15 or more rebounds. 15 against the Sixers on November 25th, 15 against the Wizards on November 27th, 20 against the Pelicans on December 7th, and 16 against the Bulls on December 9th. (It would have been nice to get that kind of production in the postseason). The C’s hot streak came at the right time as they geared up for what was their biggest game of the season at that point. On December 11th, they welcomed the 23-0 Golden State Warriors to the TD Garden. They came up just short but were able to push the scorching Warriors to double overtime and gave them one of their biggest tests that they had faced. In fact, they wore them out so much that they were handed their first loss of the year the next night by the lowly Milwaukee Bucks. The Celtics didn’t have the same problem as they traveled to Charlotte the next night and pulled off their remarkable 10th straight victory on the second night of a back-to-back on the road. After that impressive feat, the C’s hit a minor bump in the road by losing their next three. The third loss came to none other than the Atlanta Hawks and they were once again dominated by Al Horford and Paul Millsap. Horford finished with 21 points, 10 rebounds, and three blocked shots while Millsap dropped 15 points in the fourth quarter on his way to 20 to go along with his eight boards. The Celtics’ best big was Jared Sullinger with only 10 points and eight rebounds. The loss dropped the Celtics to 14-13, but they avoided falling to .500 by bouncing back and winning their next four in a row. At 18-13, they had their highest winning percentage of the year thus far. It was getting to the point where you wanted to start looking at the standings but you knew that it was way too early and the East was way too congested to get excited about playoff seeding. The Celtics reminded us that it was too early to get excited when they followed up that four game winning streak with their worst losing streak of the season. It started with consecutive losses at home against two of the worst teams in the NBA. First it was the Lakers on December 30th, then it was the Brooklyn Nets on January 2nd. The C’s avenged the loss against the Nets with a win in Brooklyn a couple nights later before proceeding to drop their next four in a row to the Pistons, Bulls, Grizzlies, and Knicks. All in all they lost six out of seven games and fell back to .500 for the first time since that loss to the Hawks a couple months prior. The 2014-2015 Celtics started their season 16-30 before flipping the script after acquiring Isaiah Thomas at the trade deadline. They somehow managed to get 40 wins and sneak into the playoffs as the seven seed. At 19-19, they were in much better shape this year when their late season turnaround began. Unfortunately the Celtics picked a bad time to hit their second worst rough patch of the year. After the win over the Knicks, they lost five of their next six. Their one win during that span came against the Grizzlies at the Garden and pushed their home winning streak to 14, the longest by a Celtics team since 1990-91. That streak was ended by the Rockets two nights later and the C’s suffered a home loss to the Thunder a few days after that. The loss of Jae Crowder certainly didn’t help. The C’s had a one game lead over the Heat for the three seed when it was announced on March 13th that Jae would be out for two weeks with a high ankle sprain. After a loss in Toronto on March 18th they had dropped to 39-30 and had significantly hurt their chances of grabbing home court advantage in the first round of the playoffs. As they had done all year, the Celtics managed to pull themselves together in an effort to save their season. They won eight of their next 10 games, including the biggest win of Brad Stevens NBA coaching career and the most thrilling regular season Celtics win in recent memory. Prior to April 1st, the Golden State Warriors had won an incredible 54 consecutive games at home. The last time they lost at Oracle was January 27, 2015. 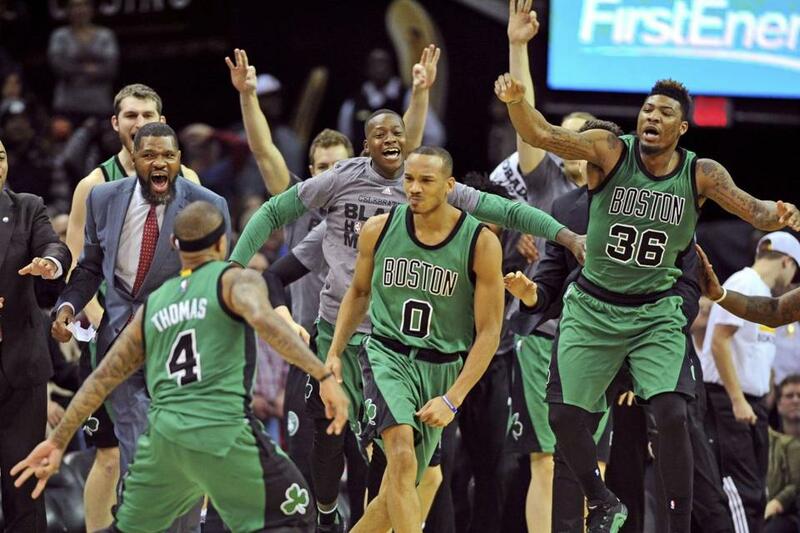 The Celtics officially clinched a playoff spot with a win over the Lakers on April 3rd. By the time they blew out the Bucks on April 8th, they were back in position to fight for home court advantage. With three games left in the season against the three teams who were closest to them in the standings, they had a golden opportunity to to grab the three or four seed. Instead they lost two of those last three to the Hawks and Hornets to finish the season in fifth. The Celtics not only lost out on home court advantage, they also ended up with the worst possible match-up that anyone could have asked for in the first round. During the regular season, they lost three out of four against Atlanta and were clearly over matched in the paint. C’s fans are familiar with first round playoff match-ups against the Hawks, as they’ve now occurred three times in the last eight years. They’re also familiar with the difficulties that the Celtics have had winning at Philips Arena. Despite knocking the Hawks out in 2008 and 2012, the Celtics were a combined 1-5 on the road in those two series’. I’m not sure why because Atlanta doesn’t exactly have one of the most lively crowds in the NBA, but this year was no different. The C’s quickly found themselves in an 0-2 hole after a couple shaky performances in ATL to start off the series. In their two big losses to the Hawks and Hornets at the end of the regular season, bad starts were ultimately the deciding factor. Game one was no different. The C’s went into the locker room at halftime facing a 17-point deficit. Like they’ve done so many other times under Brad Stevens, they came back. This time the second half effort unfortunately wasn’t enough as they fell just short, losing the series opener 102-101. Al Horford finished with 24 points and 12 rebounds. The Celtics’ two starting bigs (Johnson and Sullinger) combined for just 13 points and 14 rebounds. The biggest loss came when Avery Bradley suffered a hamstring injury and was ruled out for the rest of the series. Game two was disgusting. I don’t even want to talk about it. All that needs to be mentioned is that after all the issues with getting off to slow starts, the Celtics scored seven points in the first quarter. That’s the lowest total in any quarter for any team in the history of the NBA Playoffs. The final was 89-72. The hopefulness ended as quickly as it started in this series after the Hawks took games five and six to bring the Celtics’ season to a close. Not exactly the ending we were hoping for. I know most fans including myself had their sights set on winning a playoff series this year. While an eight win improvement over last season is a solid progression, there is still plenty of work to be done. This team provided us with a lot of exciting moments and if anything they gave us plenty of hope for the future. Brad Stevens was a great coach all year and I think he should have finished higher than sixth in the Coach of the Year voting. I do have some questions about how he handled playing time in the playoffs, most notably I’m confused as to why Tyler Zeller hardly saw the floor while Jared Sullinger continued to struggled. I realize the advantages are that Sully is a better rebounder and can spread the floor with his three point shot, but the problem is that we didn’t see him do either of those things well in the postseason. TZ can certainly run the floor better and he was more effective during garbage time in game 6 than Sully was the entire series. Injuries and playing time aside, Atlanta had the better team. The good news is that the Celtics are still in great position as far as assets and draft picks (thank you Brooklyn). All they really need is another superstar play alongside Isaiah. Now it’s up to Danny Ainge to come through this off-season and give us hope for Banner 18.